Detroit Blows. Photo by Nick Hagen. Henry The Hatter. Photo by Heather Nash Photography. Third Man Records. Photo by Michelle & Chris Gerard. Downtown Detroit’s retail resurgence has a flavor all its own, reflective of a creative community growing strong. Detroit has long been known for making vehicles, but the recent revival of this dynamic city has created a nest for artists, designers and makers with roots and style that are evoking the spirit of The D in newfound ways. of Detroiters and their passion for this city’s comeback. Pewabic Pottery tiles and vases at Pure Detroit. Photo by Michelle & Chris Gerard. Look no further than Carhartt to find a Detroit brand that speaks to the hard work and industrial backbone of the city. The Carhartt brand, born in 1889, provides stylish and quality workwear crafted in Detroit. Carhartt’s flagship store on Cass Avenue is a true tribute to the city. The historic building that houses the store has been refurbished with wood salvaged from abandoned Detroit homes and counters made by local artisans. Pewabic tiles have been handcrafted in Detroit’s Jefferson Corridor for more than a century. The Pewabic Pottery tradition of creating ceramic art is unlike any other — it has been using raw clay materials to reflect its Detroit heritage since 1903. The studio’s store offers day trips that take visitors through a behind-the-scenes tour of the tile fabrication process. The company also offers a hands-on experience through an arts-and-crafts workshop that encourages visitors to use their imagination to create tiles of their own. The seasonality of Detroit will surely give you reason to stop by Henry the Hatter in the historic Eastern Market district. Detroit’s exclusive hatter since 1893, it is one of the oldest hat retailers in the U.S. The store has had many homes across Detroit, evolving with the changes of the city’s landscape and through fire disasters. Nonetheless, the persistence of the retailer’s 70-year-old owner has kept the hatter tradition going strong by opening in its most recent location on Riopelle Street. Make sure to pop in to this vibrant Detroit staple and try on some of the most stylish and unique hats you’ll ever see. Celebrities like LL Cool J, Kid Rock and Steve Harvey are all store regulars. Better Made chips and Faygo pop. Photo by Bill Bowen. The saying goes, “You are what you eat.” If that’s true, these brands are Detroit. Sanders chocolate and cake shops have been providing sweet treats and chocolate confections in Detroit since 1875. The brand currently has seven retail locations in the metro area where ice cream and the famous Sanders Bumpy cake, chocolates and toppings can be purchased. Factory tours (with free samples) are also available at the Clinton Township location. What would the sweet be without the salty? Better Made potato chips have been a staple of Detroit since 1930. Better Made Snack Foods stays true to its heritage by producing only the finest chips using Michigan potatoes 10 months out of the year. Detroit’s favorite soda, Faygo, also can’t be forgotten. The Michigan-coined soda “pop” got its name from the sound one heard when opening a bottle of Faygo years ago. The brand has been bottling its bubbly on Gratiot Avenue since 1935, where it is still created today. Will Leather Goods. Photo by Michelle & Chris Gerard. Will Leather Goods offers high-end handcrafted bags and accessories that are reflective of owner Will Adler’s Detroit roots. The store, located on Second Avenue in Midtown, offers a hip and trendy coffee area and a space where shoppers can have their names and initials stamped into their leather purchases. Both the products in the store and the store itself are absolutely breathtaking. Detroit is the New Black may be newer to the scene, but it’s mighty and here to stay. What started as a simple T-shirt has blossomed into so much more thanks to owner Roslyn Karamoko, whose mission was to open a store that reflected the rich history of Detroit and to create a shopping space that was inclusive of everyone. The Woodward Avenue storefront also functions as a place for poetry slams and a rotating gallery featuring installations from local artists. It has quickly become a staple of the Woodward retail row. Orleans + Winder is another personal favorite for curated pieces that move away from mass production. O + W displays the passion and knowledge of textiles required to remain at the cutting edge of the fashion industry in Detroit and beyond. The store, located in Eastern Market, is a gallery-type shopping experience that provides shoppers with luxury pieces from independent designers that have been thoughtfully handpicked. Fashion incubator Detroit Denim is redefining what it means to be a domestically operated denim company. The shop’s staff is made of Detroit creatives and designers who finely craft each pair of jeans that wear the Detroit Denim moniker for superb quality. Recently, the brand launched its women’s line among a series of other products. 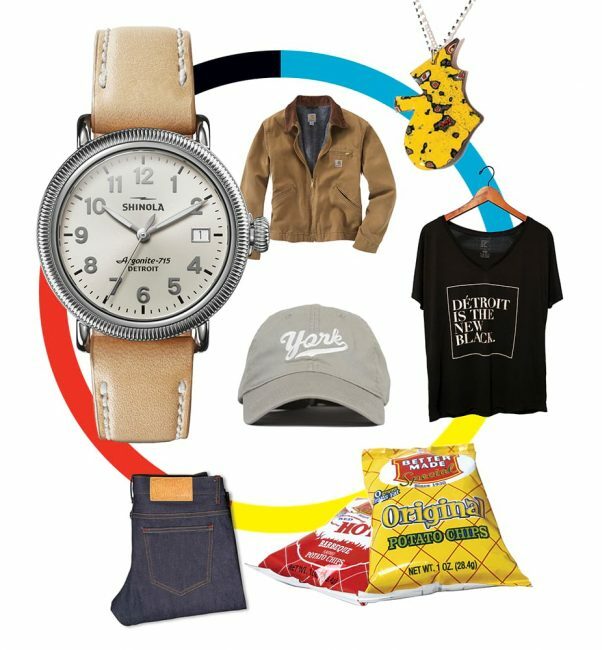 If you want to feel great about your next clothing purchase, shop the York Project online (yorkproject.com) or at various pop-ups in metro Detroit. The founder, Josh York, partners with Detroit Christian Services to donate a homeless kit with a durable tote bag, toilet paper, socks and bottled water for each York Project hat, hoodie, shirt, etc., he sells. Merit Goodness designs the most comfortable T-shirts, hats and sweaters that empower youth with each item purchased. The clothing line is all about quality over quantity, working closely with 50 Detroit students each year to fund scholarships for underserved kids. The Empowerment Plan, a nonprofit that lifts people and families out of poverty by generating employment opportunities, provides sleeping bag coats to the homeless for the harsh Detroit winters. The org has since developed a coat line for the public — Maxwell Detroit. You’ll love the men’s and women’s coats, which are super stylish and warm. Better Life Bags is also among this group of socially fiscal retailers. Similar to Empowerment Plan, this custom handbag company provides work to women with barriers hindering employment. Shinola. Photo by Michelle & Chris Gerard. Detroit hasn’t gotten to where it is today without people working together with the common goal of resurgence and growth. Detroit Rose is providing aromatherapy across the city, one candle at a time. All of the company’s candles are 100 percent GMO-free and hand-poured and feature lead-free wicks. Detroit Rose candles can be found in retailers and hotels across The D, with custom scents created for the likes of the Detroit Foundation Hotel, Detroit Blows salon and Lady of the House restaurant. The company’s beautifully fragrant clay masks, bath soaks and face and body oils have also become a must-have favorite for women all across metro Detroit. Shinola sells beautiful handcrafted watches, stunning bicycles and high-end leather. The company converted a 30,000-square-foot warehouse in the Center for Creative Studies to perfect its watches and boost employment in its hometown. You can often find community events of all types happening in the store. Hang out and grab a coffee, and even pick up a beautiful bouquet of flowers from partner florist — MADE Floral — inside the store. Shinola is known for creating long-term strategic partnerships with amazing companies and brands like GE and fashion photographer Bruce Weber and, directly next door, Third Man Records. Third Man Records is owned by Detroit native rock star Jack White of The White Stripes. Shinola’s owners and White decided to partner on the purchase of the building to expand and house the two companies. The record store functions as a recording studio and a vinyl pressing plant with a performance stage for the very artists whose music is sold there. If you are around when the stage is occupied, you can typically vibe to some live tunes while you shop and watch Detroit rock city come to life. The Detroit Foundation Hotel is not only one of the city’s hottest new social scenes but the perfect example of how partnerships can thrive and revive local business and provide a unique shopping experience for visitors. A few of the brands mentioned in this story can be found in the lobby of the hotel, including Detroit Denim, Detroit Rose, Detroit Wick, Mills Pharmacy, Rebel Nell, Woodward Throwbacks, Detroit Bikes, Detroit Laser Co. and more. The hotel has also partnered with Lincoln Motor Co. for luxury vehicles, 1701 Bespoke for custom suiting experiences, Detroit Blows for a glam star-studded makeup and blowout package and The Ten Nail Bar so hotel-goers can get pampered from head to toe. Workshop. Photo by Michelle & Chris Gerard. Been to the historic Fisher Building lately? The landmark skyscraper, home to retailer Pure Detroit, is becoming its own little shopping mecca worth wandering. There is no better place to buy a real piece of Detroit than Workshop. The modern furniture maker partners with Detroit deconstruction crews to salvage wood from abandoned homes to build furniture distinctively stamped with the address the refurbished wood came from. Other recent newcomers to join Pure Detroit in the Fisher’s retail row are Pot + Box, The Peacock Room and The City Bakery. Not Sorry Apparel stitches together a style of clothing that allows individuals to be unapologetically themselves while being cautious of the environment. The brand’s mission is driven around eco-friendly clothing that combats the problem of pollution within the garment industry. Shoppers can find the street-style clothing among some of Detroit’s most aspiring artists at Ponyride Detroit, an incubator for independent artists and designers to make and sell their products. Similar in its mission to provide fashion that lets you express yourself is Bird Bee in The Albert apartment complex in Detroit’s Capitol Park. Touting itself as a lifestyle, not just another clothing boutique, Bird Bee offers an eclectic collection of apparel and accessories that gives off a kind of bohemian, freestyle vibe with a splash of Midwest sensibility. City Bird carries Detroit- and Michigan-themed housewares, jewelry, paper goods and accessories created by independent artists and designers from Detroit and across the Midwest region. Supporting and shopping local is at the heart of this adorable store. City Bird shoppers can purchase the Rebel Nell unique jewelry line that is created from chipped graffiti gathered around Detroit. Rebel Nell supports an amazing cause at the same time by moving women toward economic freedom and self-reliance. You go, girls. Nike Community Store – Detroit. Photo by Michelle & Chris Gerard. • DD / Woodward Avenue is re-establishing downtown Detroit as a shopping haven with big-name brands such as Nike, Under Armour, Lululemon and John Varvatos, to name a few, as well as local favorites such as Detroit is the New Black. • DD / Midtown’s walkable shops and restaurants have lined the streets with specialty stores full of one-of-a kind items made by Detroit artists and national brands, including The Peacock Room, Vera Jane, Third Man Records, Detroit Clothing Circle, Shinola, Hugh, Nora and Pot + Box. • DD / In Corktown, shoppers can walk the partial cobblestone streets to shop sports collectibles at Detroit Athletic Co., men’s clothing and accessories at Gregory George or unique finds from all over the country at Eldorado General Store. • DD / Historic Eastern Market has a variety of shopping options, from Eastern Market Antiques, SMPLFD clothing and Detroit Mercantile Co. to DeVries & Co., Detroit Vs. Everybody and Savvy Chic. Downtown Birmingham. Photo by Bill Bowen. • O / Birmingham shops such as Anthropologie, Caruso Caruso, Jarbo, Tender, Found Objects, Jaus and Revive are among the top stores that line its downtown streets. • GN / Plymouth and Northville are quaint historical towns decorated with shops such as Bella Mia, Haven, 28th & Chairs, Bohemian Home, Moon & Me and Rococo. • O / The streets of Royal Oak and Ferndale are bustling with the activity of restaurants and storefronts. After you’re done shopping at favorites Lost & Found Vintage, Rail & Anchor, Pitaya and Scout, stop over at restaurants Imperial or Public House for a bite to eat. • DW / The Downriver city of Wyandotte and the Grosse Pointes offer boutique shopping and the perfect place for a stroll on the Detroit riverfront. Great Lakes Crossing Outlets. Photo by Jacob Lewkow. • GN / Twelve Oaks Mall in Novi has more than 200 stores, including H&M, Nordstrom, Club Monaco, Pottery Barn, Eloquii, Sephora and the Apple Store. • O / Great Lakes Crossing Outlets in Auburn Hills has 185 outlet stores featuring brands such as The Nike Factory, Calvin Klein, Polo Ralph Lauren and the only Shinola Detroit outlet. This is a perfect spot to scout out a great deal. Legoland Discovery Center Michigan and Sea Life Michigan Aquarium are housed here, too. • O / The Somerset Collection in Troy is an upscale shopping center with more than 180 specialty brands. The collection will expand this year, adding 15 stores and 60,000 square feet. Favorites include Neiman Marcus, Intermix, Free People, Aritzia, BCBG, Tiffany & Co., Zara and Eileen Fisher. • O / The Village of Rochester Hills is a 375,000-square-foot outdoor shopping center along the tree-lined boulevard. It features the Gap, Banana Republic, Woodhouse Day Spa, Pottery Barn and Whole Foods. • DW / Southland Center regional mall in Taylor has recently expanded, opening up stores like Forever 21, H&M, Francesca’s and a Cinemark theater. Plus, it’s added a handful of new restaurant chains such as Primanti Bros. and BJ’s Brewhouse. • M / The Hall Road Corridor in Macomb County’s Shelby Township is one of metro Detroit’s largest retail shopping hubs, with many restaurants, individual retailers and large-scale centers such as The Mall at Partridge Creek and Lakeside Mall within its boundaries. Some of metro Detroit’s signature shopping malls have preferred partner hotels. For visitors, that equates to special shop-and-stay packages with a host of extras. For more, see visitdetroit.com/deals-discounts. Somerset Inn is just steps from the Somerset Collection. The shopper’s package includes a deluxe guest room, a relaxing sit-down made-to-order breakfast for two in Crumpets Restaurant and complimentary parking, plus a designer Somerset shopping tote filled with a $20 Somerset Collection gift card, treats and special offers. The Super Shopper Package includes a one-night stay, a $10 gift card to the Somerset Collection and a gift bag filled with goodies. The package is available any day of the week. Shopping packages include Great Lakes Crossing Outlets American Express® Gift Card, Passport to Shopping, free hot breakfast and shuttle service. Relax with cocktails at The Baronette Renaissance after a day of retail therapy at posh Twelve Oaks Mall, complete with a $50 gift card. Holiday Market at Cadillac Square. Photo by Michelle & Chris Gerard. Packard Proving Grounds, Shelby Twp. Detroit’s Historic Avenue of Fashion — a shopping strip between 7 and 8 Mile roads on Livernois Avenue — is making its return as a destination for shoppers. From the 1950s until the 1970s, this commercial area was bustling with shoppers looking for high-end brands. B. Siegel Co. and Jacobson’s were just a couple of retailers that drew people to the thoroughfare. Located in the University District amid distinguished Detroit neighborhoods such as Sherwood Forest and Palmer Woods, the Avenue of Fashion is re-establishing itself as a shopping hot spot with favorites such as Simply Casual Clothing Store, DCreated and Narrow Way Cafe & Shop. Plus, you’ll find great eats here, too. Kuzzo’s Chicken & Waffles is an absolute must-stop along the Ave.
Be sure to shop the Avenue of Fashion on Small Business Saturday on Nov. 24, 2018.